3rd PMA Summer Expo Summer Dance Craze: Double the Fun, Double the Dance! The Philippine Marketing Association (PMA) will once again bring you the PMA Summer Expo this March 29 to 31 at the Glorietta Activity Center in Makati City. This is the third Summer Expo that the PMA will hold, featuring various activities that will kick-start the season. While the Summer Expo is aimed at people or businesses who want to get ahead of the rest in the field of marketing, there’s also entertainment for everyone to see, such as the Summer Dance Craze (Days 1 and 2, March 29 and 30) and Presentations from various companies (Day 3, March 31). 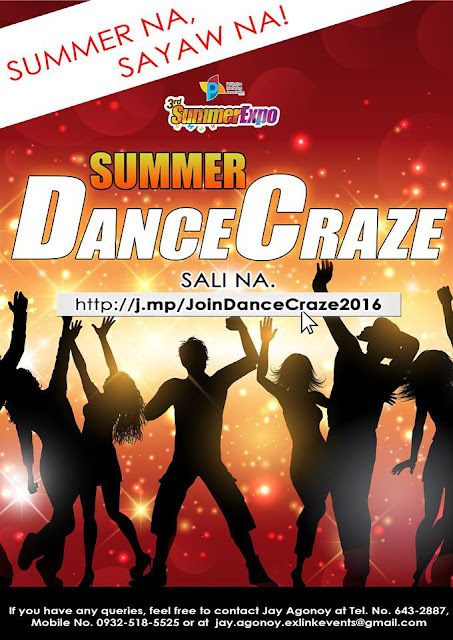 This year’s Summer Dance Craze is set to cover two days of the Expo, with two categories–the solo/duo and group dance categories. Php5,000 will be given for the first-placers, Php3,000 for the second-placers and Php2,000 for the third-placers. Everyone is welcome to join–whether you like Jazz, Hip-hop, Ballet or any dance under the sun, this is for you!